The amount of Bitcoin spent during this year’s shopping “holidays”, also known as Black Friday and Cyber Monday, set a new record in the cryptocurrency ecosystem. A total of $296 million in Bitcoin were spent by consumers during the weekend. This turns Bitcoin into the ninth biggest payment method used across the world between the 28th November and 1st December, according to results provided by the digital commerce platform Bitnet. Like in previous years, credit cards like Visa, MasterCard and American Express and the payment processor PayPal occupied the top places of the list, but Bitcoin’s year-on-year growth is self-evident. The data shows that Black Friday is still the most popular shopping day when compared to Cyber Monday. On the 28th, consumers spent $152 million in Bitcoin, while “only” spending $144 million on the 1st. “Like all other payment networks, Bitcoin saw a surge in volume over Black Friday and Cyber Monday, with higher than usual payment totals over the two days”, said Akif Khan, VP Solutions Strategy at Bitnet, quoted by HereIsTheCity.com. “The Bitcoin network handled $296 million in two days – that’s impressive”, he added, especially “when taking into account the currency is only five years old and is still growing with respect to merchant and consumer adoption”. 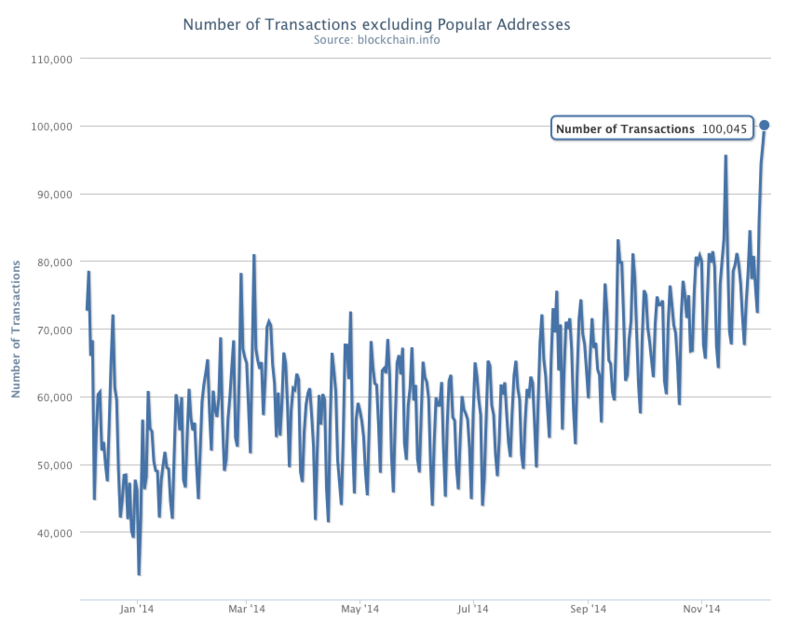 The high number of transactions is visible below. This document shows that the last days of November registered the highest number of Bitcoin transactions in 2014, Blockchain.info revealed. One of the facts that certainly contributed to this year’s results was the growing phenomenon called Bitcoin Black Friday. More than 1,200 merchants joined this year’s online event. Besides offering huge Bitcoin-exclusive deals, the event held last Friday also allowed the Bitcoiners to instantly purchase small amounts of cryptocurrency with a credit card.